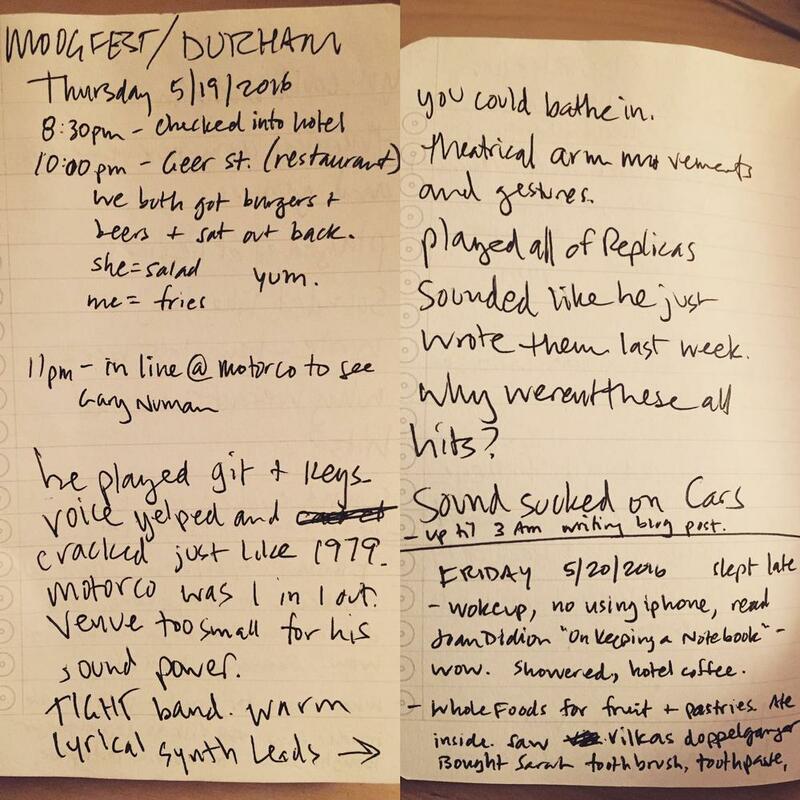 I tried going back to a paper journal for our trip to MoogFest. As much as I like Day One, and as much as I love Drafts as the first stop for journal-y thoughts, it’s just flat-out easier and more socially acceptable to whip out a Field Notes-like1 notebook when things are moving fast and you’re moving around a city you’re visiting. I may or may not get around to transcribing all these scrawls into Markdown, but the important thing is that pen + paper allow for non-linear, shorter, and more frequent entries than even jotting down text into something like Drafts first. The biggest thing I give up by not writing directly into Day One — which I would never do anyway, because using Drafts first is way more stable and easier to edit — is geolocation of entries. Ah, well. I shoot enough photos on the phone that I can always get a vague idea of our location later, and Day One will pick that info up. But location data is less important than what happened and when. I’m way more likely to scribble down a word or two and a timestamp here or there on paper.